Is it an obstacle — or opportunity? 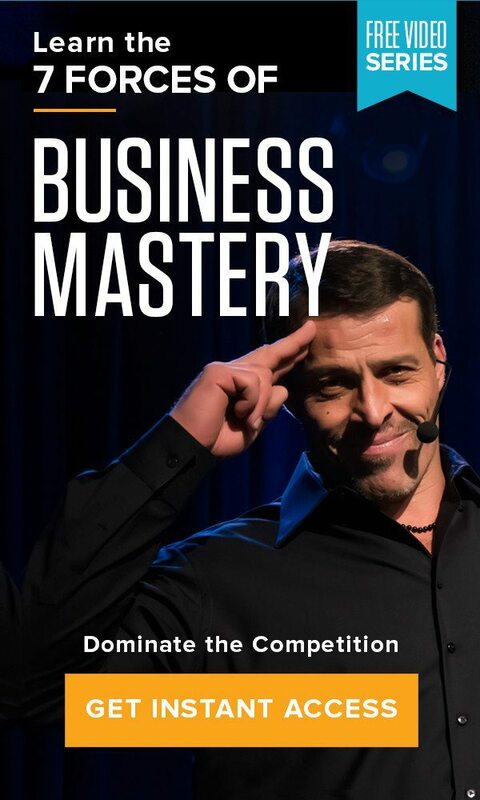 Home » The Tony Robbins Blog » Career & Business » Is it an obstacle — or opportunity? Many of us have been conditioned to think that challenging times mean there is no opportunity for growth or success. But some of the best companies have excelled in the most difficult eras. In fact, more than half of the Fortune 500 were birthed in an “economic winter” — a recession or a depression. Companies like Disney, Apple, Exxon, Microsoft and FedEx were launched when the rest of the business world was licking its wounds. And a number of other businesses have used an economic contraction as a chance to reinvent themselves entirely, creating a breakthrough that led to expansion. The fact is, the only constant is change. And this does not only include changes in the economic environment, but changes in competition, technology, culture, customers and employees. But if you tell yourself that conditions and circumstances control the fate of your company, you are falling victim to a story of defeat. Sir John Templeton once said, “The best opportunities come in times of maximum pessimism.” But it takes an eye for efficiency, optimization, anticipation and creativity to find and take advantage of these opportunities. It’s what made the difference between Barnes and Noble and Amazon. Blockbuster Video and Netflix. Napster and Apple iTunes. Because it’s not just about creating value any more. It’s about adjusting, evolving, and adopting the principles and strategies necessary to take your business to the next level. Because the competition in any profitable industry is fierce. And the lifecycle of ideas and products has shrunk as the time span between the moment you come up with a breakthrough concept and the instant somebody else comes up with a better one, has gone from decades to years, to months. Consider Starbucks. While we usually think of the coffee giant as flush with sales and profits, they are actually the perfect example of a company that has figured out not only how to survive economic hardship, but how to thrive. At the end of the second quarter in 2008, Starbucks quarterly earnings had plummeted. Global operating income had sunk 26% and the company’s in-store sales figures were negative for the first time in the brand’s history. Meanwhile, consumers were tightening up and limiting their spending as the global recession took hold. In July of 2008, Starbucks lost money for the first time, reporting a net loss of $6.7 million for the third quarter. In the fourth quarter, profits dove 97% and earnings for the year were down 53%. As financial crisis sprawled across Europe and Asia, Starbucks sales figures were at a negative 8%, effectively rendering Starbucks’ existing economic model completely inept. At this point, Starbucks chairman, president and CEO, Howard Schultz returned after eight years away from the business, with the sole mission of helping his beloved business rise out of the flames before it turned to ashes. Now imagine you were in Schultz’s position. What would you do in that situation? How would you steer the company through the worst financial crisis in decades? When Schultz came back in the middle of the crisis, he ceased the company’s go-go expansion. He cut out nearly $600 million in costs, and for three hours on February 26, 2008, he orchestrated the closing of more than 7,000 American Starbucks stores for a retraining session for employees. Schultz effectively used the recession as the impetus to re-focus on his core business. He asked himself what business Starbucks was in, and then had a good long look at what business they needed to become. He had managed to rekindle love for his customers, and checked the ego that so easily controls any company that loves its product more than the people they want to enjoy it. Schultz allowed the crisis to create breakthrough, and found ways to innovate, adapt and evolve. Such is the driving force for Business Mastery. It’s about creating breakthroughs in your business by first focusing on your psychology and then giving you the tools to innovate, adapt, and evolve in any economic situation. Is it time to take your business to the next level?